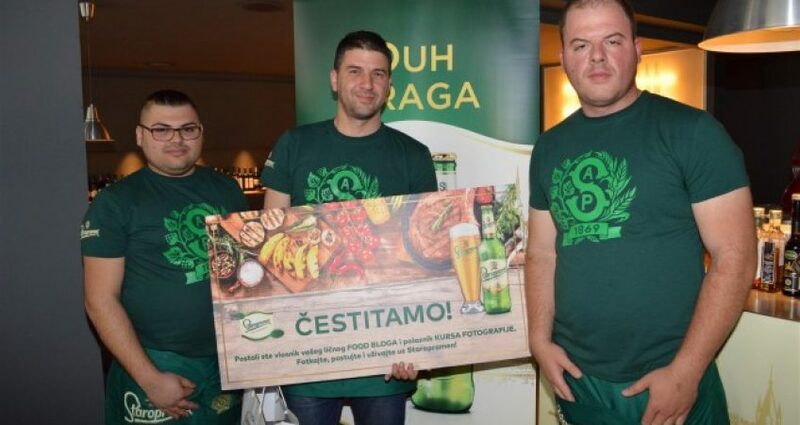 And it was exactly like that in the finals of this year’s „Staropramen culinary challenge“ where three talented culinary lovers competed – Srđan Jerinkić from Kikinda, Igor Mihailović from Aranđelovac and Dejan Stojković from Bor. Expert jury chose the three of them among more than 40 participants who created original recipes during the „Challenge“ inspired by Staropramen and Czech cusine. Thanks to the knowledge of „culinary skills“, Igor Mihailović triumphed and won a personal food blog, professional camera and a „food photography“ course as the first prize. In one word, all that a future star of the local food blog scene needs. “I like dishes that are quick and easy to prepare, but that also can be nicely enriched with a touch of imagination. That is how I applied for competition with the recipe „Beefsteak medallions with Staropramen“. I love experimenting with taste, and I fell in love with cooking some 15 years ago. Now, this hobby has moved to a higher level and I can’t wait to start my own blog that I won“.– said the winner Igor Mihailović who revealed his „secret recipe“ for hamburgers after the competition: „You should put some butter on the hamburger to make it juicier, some unpeeled garlic and rosemary that adds great aroma“. In addition to the winner of the competition, expert jury which consisted of famous bloggers Maja Petrović, Maja Babić, Marija Sponza, Tanja Leković, Dragana Pušica, Olivera Senić and Aleksandra Jovanović, representative of portal Stvarukusa.rs, based on the presented culinary talent, announced the runner up Srđan Jerinkić, while Dejan Stojković won the third place. Break 2 eggs, whisk egg whites separately, and egg yolk with flour, Staropramen, olive oil and pepper. Add the egg whites into the egg yolk mixture, to get a little thicker batter than batter for pancakes. Roll in flour salted beefsteak, then into prepared mixture and in the end put into boiling oil. Fry briefly until medallions become golden yellow … serve them with sweet and spicy sauce or tartar sauce with 4 kinds of cheese.